As the Internet of Things (IoT) heats up as a topic, and as big data continues along on its path to maturity, streaming data technology, which fits perfectly in the intersection of the two, is having its shining moment. How appropriate, then, that today comes big news from a streaming data pure play and a major Hadoop distributor. Specifically, Confluent, the commercial entity behind (and founded by the creators of) Apache Kafka, and Hadoop distribution vendor MapR, are each announcing new releases. Confluent is announcing the 2.0 release of its Confluent Platform, based on the 0.9 release of Apache Kafka, released two weeks ago. MapR, meanwhile is announcing the addition of its own streaming technology, dubbed MapR Streams, right into the core of its distribution. Again, the keys here are IoT and maturity. In the case of Kafka, the new 0.9 release adds important new features in the realm of multi-tenancy and security. In MapR’s case, the addition of its own streaming technology is rooted in the recognition of the multiple workloads that Hadoop clusters serve, and the desire by customers to handle streaming data in-place, on the very same cluster where those multiple workloads are handled. Kafka 0.9 offers the ability to assign quotas to specific queues, such that reads and writes on that queue will be throttled down if the volume reaches its quota. It also offers new authentication, authorization and encryption features. 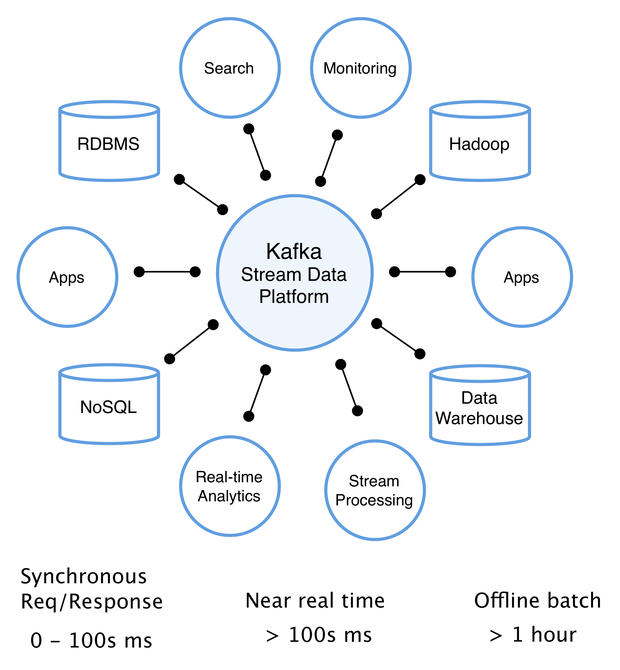 A new component, called Kafka Connect, provides a platform for building data connectors much more easily than was possible previously. In fact, Kafka Connect handles multi-process concurrency and failover operations transparently, so that connector developers don’t have to handle that plumbing work themselves. Applications don’t have to use connectors though; they can in fact connect to Kafka directly. In order to make this kind of development work easier, a new client for Java is available as are both a client and a producer for the C programming language. The Java bridge existed before but was more rudimentary than the one shipping today. The C language client and producer are brand new and, one would imagine, offer connectivity across a great number of platforms, including even embedded systems, where C code lives on.